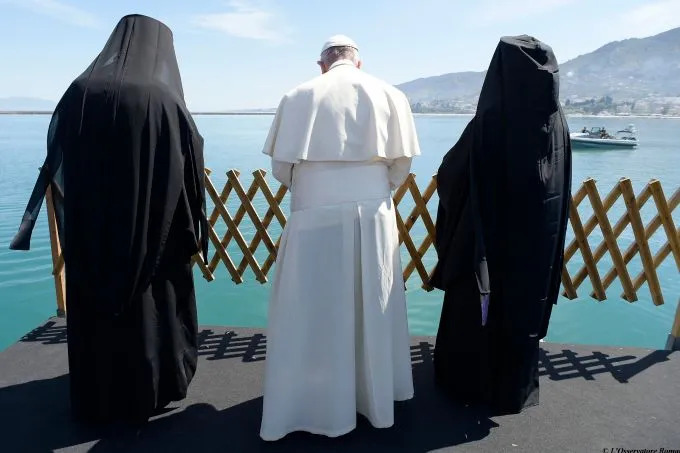 Pope Francis, Patriarch Bartholomew and Archbishop Ieronymos look out at the sea from Lesbos Apri. 16. Credit: L'Osservatore Romano Lesbos, Greece, Apr 17, 2016 / 05:13 pm (CNA/EWTN News).- Forced migration affects millions of people and is “a crisis of humanity.” That is what Pope Francis and two leading Greek Orthodox churchmen have said in a joint declaration signed on the Greek island of Lesbos. “Europe today faces one of its most serious humanitarian crises since the end of the Second World War,” the declaration said. Pope Francis, the Orthodox Patriarch Bartholomew of Constantinople, and Orthodox Archbishop Ieronymos II of Athens and All Greece signed the declaration April 16. They traveled to the Greek island to meet some of the thousands of refugees and migrants trying to enter Europe. “We urge the international community to make the protection of human lives a priority and, at every level, to support inclusive policies which extend to all religious communities,” they said. At a Lesbos port, the three religious leaders said prayers and threw laurel wreaths into the sea, where thousands of migrants have lost their lives. “World opinion cannot ignore the colossal humanitarian crisis created by the spread of violence and armed conflict, the persecution and displacement of religious and ethnic minorities, and the uprooting of families from their homes, in violation of their human dignity and their fundamental human rights and freedoms,” their declaration said. “As leaders of our respective Churches, we are one in our desire for peace and in our readiness to promote the resolution of conflicts through dialogue and reconciliation,” the Pope and the Orthodox leaders said. They called for a broad international consensus to defend the rule of law and fundamental rights, to protect minorities, to develop safe resettlement procedures and to eliminate unsafe routes. They said the Aegean Sea and the entire Mediterranean were among these unsafe routes. “In this way we will be able to assist those countries directly engaged in meeting the needs of so many of our suffering brothers and sisters,” they said. Over 150,000 refugees and migrants have arrived in Greece by sea so far in 2016. Many of the refugees in Lesbos come from Syria, Iraq and Afghanistan. The declaration declared solidarity with the people of Greece, saying these people have responded to the crisis with generosity despite their own difficulties. Pope Francis and the Orthodox leaders urged an extension of temporary asylum, refugee status for those eligible, and expanded relief efforts. The declaration voiced resolve to strengthen efforts to promote full Christian unity. “By defending the fundamental human rights of refugees, asylum-seekers and migrants, and the many marginalized people in our societies, we aim to fulfill the Churches’ mission of service to the world,” they said. Pope Francis returned to Italy with 12 Syrian refugees, six of whom were children. They will be hosted by the Sant’Egido Community.